It remains unclear whether total gastrectomy is necessary for patients with proximal T2/T3 gastric cancer. To explore the oncological safety of proximal gastrectomy for proximal T2/T3 gastric cancer, in this study, we evaluated the metastatic rates in and the therapeutic effect of dissection of key distal lymph node stations that are usually excluded in proximal gastrectomy. 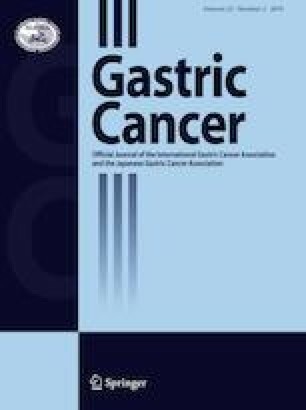 In this study, we examined 202 patients seen between January 2000 and December 2012, who underwent total gastrectomy with lymph node dissection (D1/D1+/D2; 2/17/183) and was pathologically diagnosed as T2/T3 gastric cancer exclusively located in the upper third of the stomach. The theoretical therapeutic necessity of dissecting lymph nodes at each lymph node station was evaluated based on the therapeutic index calculated by multiplying the frequency of metastasis at each station and the 5-year survival rate of patients with metastasis to that station. The 5-year overall survival rate (95% confidence interval) was 72.9% (65.5–80.3). The metastatic rates at #4d and #12a were very low (0.99% and 0.006%, respectively), and those at #5 and #6 were zero, and therapeutic indices for #4d, #5, #6 and #12a were zero. On the other hand, the most frequent metastatic station was #3, followed by #1, #2 and #7 (overall metastatic rate > 12%), which was consistent with the order of the therapeutic indices. Considering the nodal stations that need to be dissected, proximal gastrectomy would be the choice and oncologically safe for patients with T2/T3 proximal gastric cancer. A correction to this article is available online at https://doi.org/10.1007/s10120-019-00955-7. The authors have no conflicts of interest to declare in relation to this article. This study was conducted with the approval of the National Cancer Center Hospital Ethical Committee (No: 2017-077). Japanese Gastric Cancer A. Japanese gastric cancer treatment guidelines 2014 (ver. 4). Gastric Cancer. 2017;20(1):1–19. Epub 2016/06/28. https://doi.org/10.1007/s10120-016-0622-4. PubMed PMID: 27342689; PubMed Central PMCID: PMCPMC5215069 Phamaceutical, Sanofi, Merck Serono, Yakult Honsha, Daiichi Sankyo, Otsuka Pharmaceutical Factory, Takeda Pharmaceutical, Johnson & Johnson, Asahi Kasei Pharma, Eli Lilly Japan, Pfizer Japan, AJINOMOTO Pharmaceuticals, ONO Pharmaceutical and Kaken Pharmaceutical and grants from Covidien Japan, Shionogi, Bristol Myers Squib, Japan Blood Products Organization, Torii Pharmaceutical, Mitsubishi Tanabe Pharma, bbVie GK, Otsuka Pharmaceutical, Yoshindo, Eizai, Abbott Japan, CSL Behring, Teijin Pharma, Tsumura, Nippon Kayaku, Miyarisan Pharmaceutical, Novartis Pharmaceuticals Japan, KCI, Toyama Chemical, Maruho, Hogy Medical and MSD, outside the submitted work. Dr. Sano reports personal fees from Chugai Phamaceutical, Covidien Japan, Eli Lilly Japan, Johnson & Johnson, Olympus, Otsuka Pharmaceutical Factory, Taiho Pharmaceutical and Yakult Honsha.